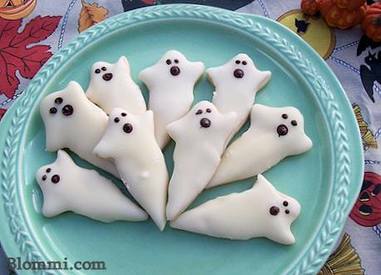 This White Chocolate Covered Shortbread Ghost Halloween cookies is easy and delicious Halloween recipe. I love shortbread, and I love chocolate, so this seemed a logical combination. Temper your chocolate or put chocolate and milk/cream into a shallow microwave safe bowl (it should be wider than the cookie shapes, as yo will be dipping cookies in). Drop the cookies in one by one face down flat. Carefully remove each, watch out the chocolate is hot. As you flip them over to put on cooling rack, hold them with the ghosts “tail” down for a few seconds, so chocolate flows in this direction a little, then lay flat on racks.